Moving Connections has been providing moving and shipping services to Northern Utah residents for more than thirty years. Moving Connections hires only experienced professional moving crew members. Moving Connections is not only federally licensed, but we are also bonded and insured in accordance with federal regulations. That might make us sound like some giant, impersonal corporation with its headquarters in some far-off state. But nothing could be further from the truth. In fact, Moving Connections – although it provides big service – is in fact a modestly sized company that is attentive to customers, whether they have small or large moving needs. And we don’t throw your goods into a fifty three foot trailer along with a half dozen other customers’ goods, then wait two weeks to ship it, then charge you thousands of dollars like the huge companies do. We load our twenty-six foot trucks with your goods and your goods only, and then go immediately to the destination of your choice. But don’t think that just because we’re responsive to the average Joe or Jill that we’re not professionals. We are big time professionals. Just look at our qualifications above. And we’ve got a pretty cool name – Moving Connections. And speaking of cool, we offer storage facilities, both climate controlled and conventional, at competitive rates for your needs. That means we’re a full service moving company who is happy to move your gun safes or grand pianos or exercise equipment or whatever. But we’re also small enough to be responsive to local needs. If Moving Connections is moving you to Murray it's a perfect time to begin to utilize the many resources and bounties of Murray. For example click on the picture to the left to go the Moving Connections 'Support - Advice - Assistance' page and discover Murray for the first time. Once you are on the 'Support - Advice - Assistance' page go ahead and open the .pdf link found there and tape the list of emergency and useful phone numbers on your refrigerator. Moving Connections has gone to great pains to find those links and connections to integrate you quickly into Murray life. If you’re a business professional, then you want and deserve professional service from the companies whose services you purchase. And that’s just what you’ll get from Moving Connections, your Murray corporate mover. As a federally licensed, bonded, and insured moving company, Moving Connections is committed to providing the highest caliber moving service available. And we are conscientious in the personnel we hire. We use only experienced movers, never anyone from a temp help agency. That means a lot when someone is handling your valuable machinery, computers, or art work. It also means a lot when it comes to efficiency and getting things done on time, safely. Although our most popular service is the full service move, residential or corporate, Moving Connections does offer a potentially cost-saving service known as "labor only moving help". This is a labor-saving service that allows you to pack your routine household goods, while our professional Murray moving crew does the heavy lifting and loading. The Moving Connections crew will also professionally wrap your furniture and other such items with stretch wrap and moving blankets for their protection. The other part of this type of service that saves you money is the fact that you will provide the moving truck and the driver. Usually this takes the form of the customer renting a truck and driving it himself/herself to the final destination. Of course, this means that you provide a major portion of the labor, including the driving, plus the expense of the vehicle and its fuel and mileage, plus any insurance, etc., that you might opt to purchase. Moving to another home can be a very stressful event. Or it can be a seamless transition to a new location. A local Murray professional moving service like Moving Connections can make it the latter of these two options. You have enough to be concerned about with stopping services at your old residence and transferring them to your new one, or wondering whether you’ll get along with your new neighbors, or how your children will adjust to the new school and new schoolmates. Plus a thousand and one other matters. So your plate is full. Let Moving Connections provide a full door to door moving service for you so that your relocation can be a peaceful transition. 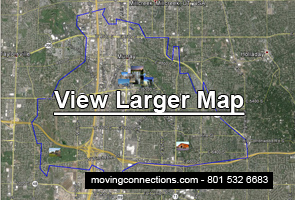 We are experts at local moves along the Wasatch Front and throughout Utah. Our crews are made up of experienced professionals, and Moving Connections has a current federal motor carrier number, meaning that we are federally licensed, bonded, and insured. So we’re professionals.